Porcupine families behave similar to humans. 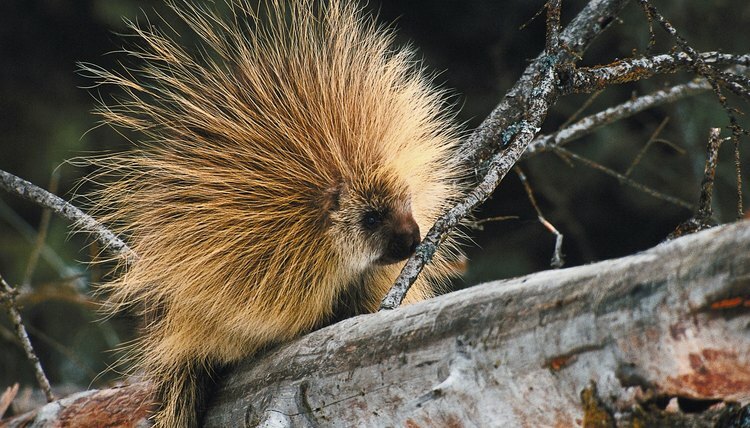 A young porcupine offspring requires food and shelter, for example, and relies on its mother for provisions. As with humans, once children are experienced in how to care for themselves -- and reach a certain age -- the young are released into the world on their own. Mother porcupines care for their young from the earliest stages of their lives. The birthing process, for example, is carried out especially to give the newborn cushion and comfort when being pushed from the womb. According to Animal Corner, mother porcupines construct burrows made from tall grass and leaves prior to giving birth. Baby porcupines are birthed onto the natural cushion, which also provides cover from potential predators. The soft quills of a young porcupine will begin to transform into hard and sharp versions, beginning after a few days of life. Mothers communicate with their young via tactile sensations and vocal sounds. A mature porcupine will chatter teeth and raise its quills if it senses danger -- a lesson its young will imitate and learn. Raising its quills and emanating a putrid odor often keeps lurking animals, such as mountain lions, at bay. Young porcupines will also follow the mother up trees to sleep as a way to stay out of reach of predators. Mothers will climb trees for hours at a time to scavenge for food. According to the University of Michigan, mothers will forge for acorns, beech nuts, twigs and pine needles. Mothers encourage their young to follow her to the base of a tree. The young porcupines wait at the base of the tree, while the mother climbs to forge for food. Staying concealed via tall grass or hollow logs, for example, helps young porcupines remain hidden from predators while waiting for meals. Father porcupines often play little or no part in the raising of their offspring. According to National Geographic, a mother will care for its young -- between one and four babies at a time -- for 12 to 24 months. A young porcupine is left on his own before the second winter of his life sets in. A young porcupine has learned all of the necessary tools for surviving in the wilderness from his mother, by the time the second winter hits.